We don’t know about you but after taking the Christmas decorations down, our houses are just plain depressing. Nothing that a few new indoor plants can’t solve however! Every January we take stock of our indoor plants – pitch what is looking sad and add fresh ones to the mix. We do this purely to add a bit of something beautiful, living and green to our homes…but did you know about all the health benefits of indoor plants? Studies have shown that they can decrease stress, purify the air, improve health, promote faster healing and sharpen focus. Say what? So, how many plants do I need? To purify air, improve health, reduce fatigue and stress, place one large plant (8-inch diameter pot or larger) approximately every 130 square feet. In an office or classroom setting, position plants so each person has greenery in view. We generally keep a few plants in each room in varying sizes, depending on the size and scale of the room. In the picture above, we have 3 small bird’s nest ferns nestled in the white planter. We LOVE bird’s nest ferns for inside and outdoor spaces during the summer months. In fact, these pretties were outside on our outdoor dining table all summer and we brought them in to spend the winter nice and cozy inside. In the spring, we’ll likely put them outside again. 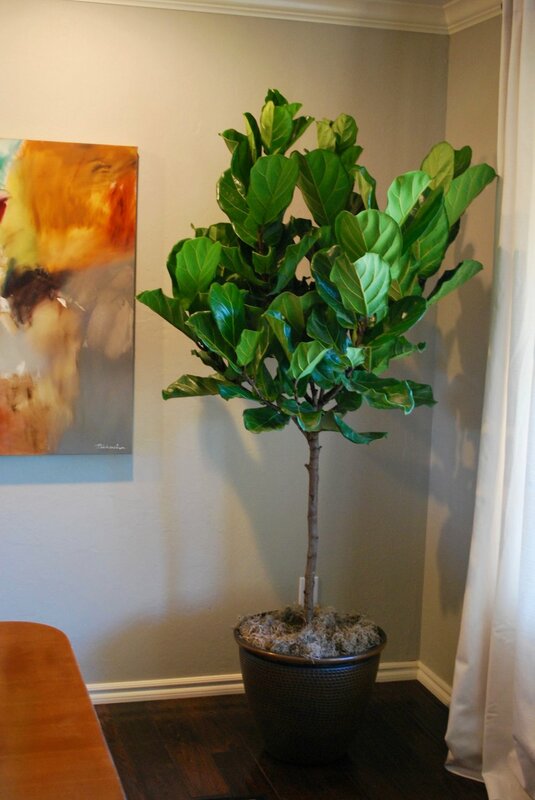 Gotta say, we love our fiddle leaf fig plants. We have a tall one and a small 6” one. We love the presence and height of the tall one. It’s about 6 feet tall and fills in a blank corner of the dining room perfectly. Give these plants bright light, preferably by a sunny window, and turn the plant every few months once it begins to lean toward the light. Water when the top inch of soil is dry. Test this by sticking your finger in the soil. Pretty soon you'll figure out about how often you need to water. Keep in mind that this may fluctuate based on seasonal humidity, etc. We are watering all our houseplants more often in the winter due to drier air inside because the heat in on. If the leaves get dusty, no worries. Just dust the leaves every now and then with a soft cloth so the leaves can absorb light. Another favorite indoor plant is the snake plant a.k.a. mother-in-law tongue and officially called a sansevieria. Friends, these are really, really hard to kill. It can tolerate low light and is forgiving if you forget to water it weekly. It’s a great plant for small spaces because the vertical leaves don’t take up much space to the side. It’s available in many different sizes to fit the perfect space in your home or office. It comes in smaller sizes that would be great for placing on a desk or in a large size to make a striking presence in the room. This plant is another great one to use outside during the warm summer months. It gives wonderful height to any indoor or outdoor space. A new year calls for new plants! Let us help you find the perfect indoor plants for your home or office. We work with you to determine the best plants based on your size, scale and lighting requirements. It's an inexpensive way to add a pop of color to your space. In this picture we added a monstera plant to a client’s pretty planter - we love those broad leaves! Newer PostTHE DIRT - Let's get ready for the spring planting season!